Fishing guides that specialize in fishing the backcountry islands of an estuary. Most Inshore fishing guides consider themselves "backcountry". Flats and backcountry fishing done right. Capt. 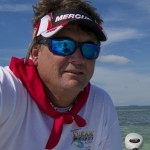 Steven Lamp has the nicest boats in Key West for flats fishing and backcountry fishing. Using Yellowfin boats powered by new Mercury outboards, Daiwa fishing gear for light tackle and Orvis rods and reels for fly fishing Capt. Steve offers more to his customers than any other fishing guide. Setting the bar for fishing charters.